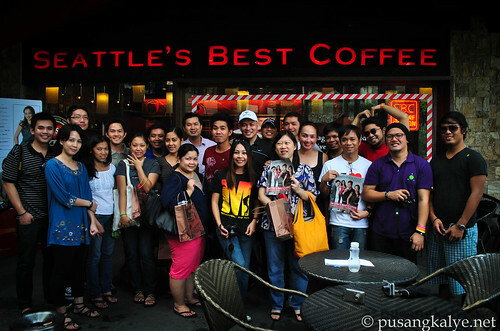 Seattle's Best Coffee has turned 10 in the Philippines. That's a decade of love for a good brew. 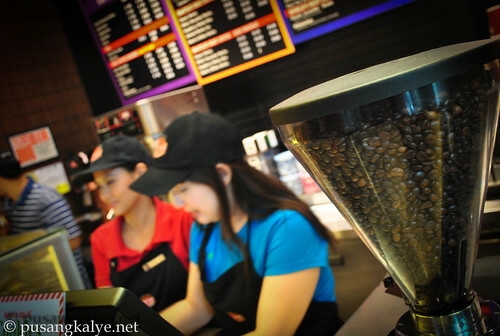 Let's admit, we Filipinos love coffee. May it be in handy 3-in-1 sachets, home made or in chick cafe's sprawling all over the Metro. Yes, drinking coffee has never been this pleasurable and fashionable. Good thing Seattle's Best is in the Philippines as it offers a pleasing alternative to the discriminating tongue of Filipino customers. This reminds me of a blogger who became very controversial in my circle becuase of his endless assaults on call center agents. He described members of this workforce in a bad light that he created a lot of adversaries. One of his issues has something to do with agents love for expensive brews. I personally don't see anything wrong with that as long as you don't steal money to buy one. Drinking coffee has become a lifestyle and being seen in one of these cafe's is in a sense fashionable. Some people might not be comfortable with it but it is the reality. 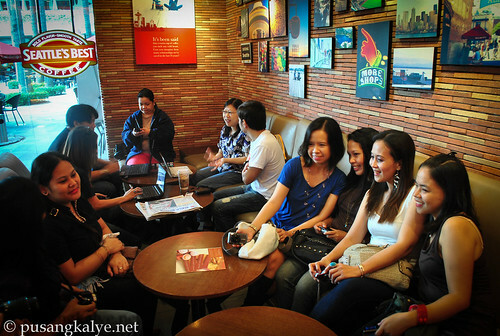 But I don't want to divert further into the topic, what I wanna write about is about our experience last November 29 at Seattle's Best Coffee (SBC) at greenbelt 3 to celebrate the company's 10 years of solid presence in the Philippines. 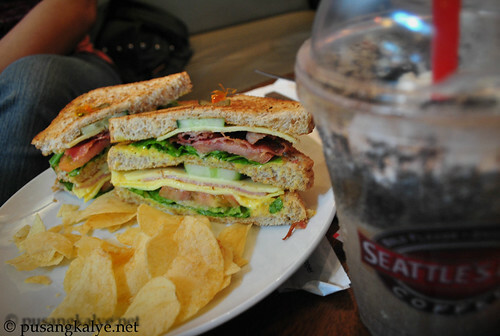 Many bloggers came for a day of coffee and good food. 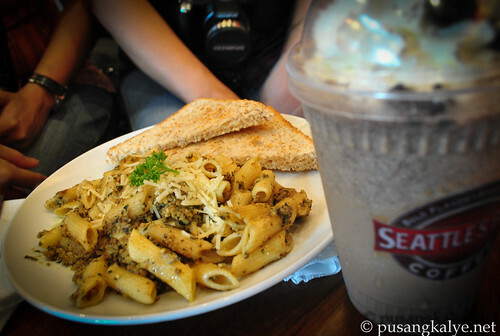 Yeah, aside from the best Arabica roasts, SBC offers freshly cooked meals which we sampled. 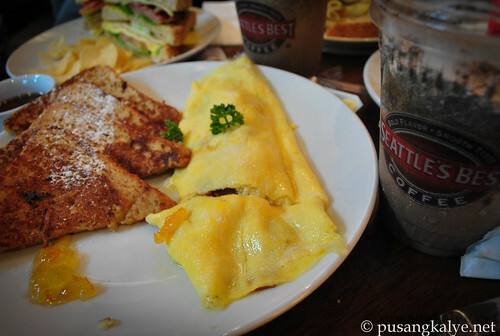 This is what I ordered because I heard their omelette is really good and I was not disappointed. The French toast is also one thing I like a lot. 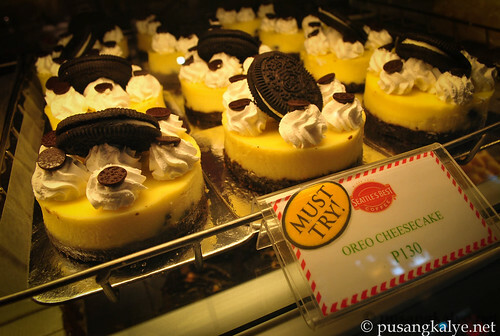 It has a sweet taste that really satisfied my sweet tooth. I also love their Christmas offering COOKIES AND MINT coffee. Smoked ham, bacon, fresh lettuce, tomatoes, cucumber, egg and cheese topped with honey mustard dressing and a side order of corn chips. Egg, Schublig, Bacon Strips, Pancakes, Wheat Bread, Fruit Marmalade. 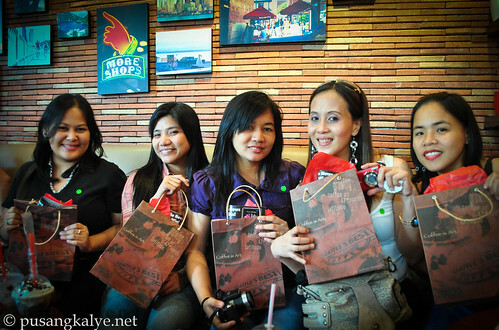 I was caught in the middle of mom bloggers that day and being around them is not just fun but very informative as well. best of all, I got the chance to taste all the available food on the table. Hahaha. This year, SBC unveils a campaign that celebrates SBC's 10 best customers. These 10 dynamic individuals are renowned in their various fields. They are the best in the industry and are literally Seattle's best. The 10 includes Jowee Alviar and Mon Punzalan of Team Manila, manny Torrejon, a businessman/ coffee connoisseur, Francis J. Kong, business columnist / trainer/ consultant, Ivan Acuna, Metalscape artist, Joayce Ramirez, International publicist, Paul Soriano, director/producer, Akihiro sato, model/actor, Cristalle belo Henares, entrepreneur, Alyanna Martinez, fashion stylist and Stephanie Henares, animal channel vj. No less than the famed International publicist Joyce Ramirez was there to join us in experiencing SBC's delicious coffee. The bloggers present really enjoyed hanging out at SBC gb3. 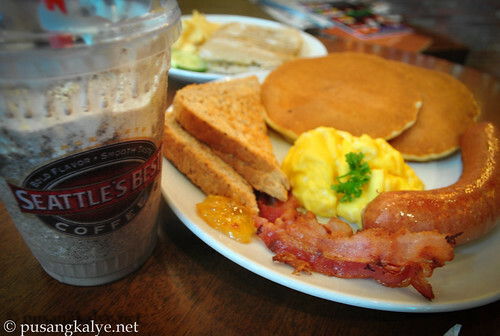 Good coffee, good food, fun chitchat. Joyce Ramirez.....international publicist, one of SBC's best customers. 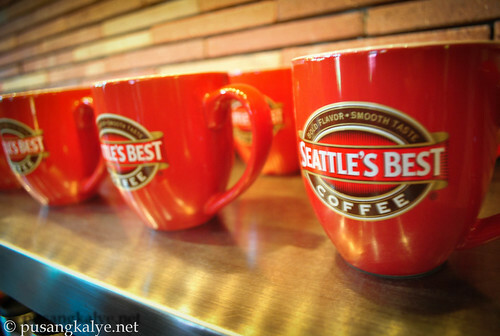 Seattle's Best Coffee Philippines, 10 years of solid commitment to Filipino coffee lovers. A good choice among the number of coffee shops around. I say, SBC is still one of the best in the industry. Bino-- e, long holiday kasi--asan na ang mga baguio pics? I love Seattle too! Especially the Javakula treats. Didn't know that theyare already 10 years here. Di pa ako nakapasok sa Seattle's Best kahit kelan hehehe. Nagutom ako sa post na to. Parang lahat eh ang sarap tignan. Once pa lang ako napupunta jan. Kapag nakakaladkad lang ng malilikot na kaibigan. Haha. 10 years na pala dito sa Pinas sila? ikaw kasi anton eh hehehe (nanisi daw ba hehee)..